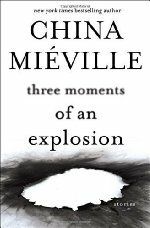 In this recent collection, China Miéville explores the fantastical, terrifying, surreal and moody. The Apocalypse Fiction Club will discuss three stories from the collection over the next three days. Today: Polynia. Charlie Jane Anders briefly reviews the story on i09, or check on the NY Times review of the whole book here, briefly describing this piece as "Londoners grapple with the sudden appearance of a flotilla of icebergs that waft in the air above the city. " I need to reread it. I am still confused about what it is the explorers see. Or not even what they see, which remains purposefully unknown, but what is hinted at.